The plot of Zee 5’s latest release, Kalavu, is held together by an incident of theft. Hence, the title. But there’s also another thread that connects the main characters of Kalavu together: Lies. It isn’t a coincidence that Kalavu opens with a couplet structured like a Thirukkural. The Thirukkural, in one of its verses, says that even a lie will be placed on par with the truth if it gives unblemished returns. The film begins with white lies: A son lies to his parents about drinking; a man lies to his friends to make them meet him. But as the plot unfolds, the lies grow darker and so does the intent. Kalavu acts as more of a reminder of our clandestine selves. The writing is intelligent and so is the screenplay. With the scenes and its match cuts, director Murali Karthick firmly positions himself as an unreliable narrator, keeping you hooked. 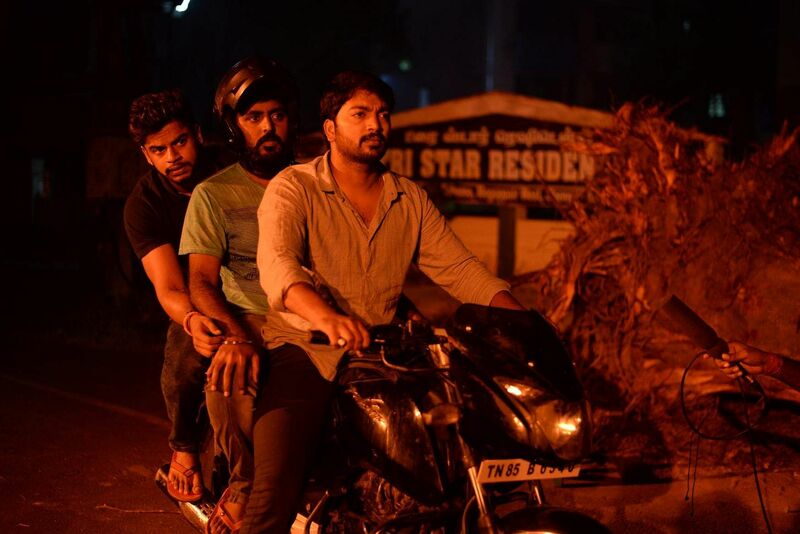 Sujith (Kalaiyarasan) and his friends escape the cops, fearing that they might get caught for driving under influence. They run out of petrol and leave their bikes in a deserted street. You think they got away, but did they? Kalavu unfolds piece by piece, where you are handed chunks that you don’t even realise go together. And when those revelations arrive, I was pleasantly surprised, more than once. When Sujith’s parents realise he is taken by the police, the father repents for not knowing his son better, when we expect him to go berserk. Murali Karthick seems to know what the predictions are and gives a plausible nudge (even if sometimes naively) in the other direction. But it is this unpredictability that makes Kalavu an interesting watch. I quite liked the organic punchlines the film throws up. A memorable example comes from Sujith who observes that there are two kinds of people in the world: ‘the one who gets away with anything with his money’ and the other, ‘the one who does anything for money’. Another comes from Gautham (Karunakaran) who says, “Nallavana iruntha andha peru mattum than sambadhikalam. Aana kettavana iruntha, nalavandra pera thavira elathayum sambathikalam.” These lines ring deep and also quite effective, considering the context. Which is why I was surprised when the film chose to have sweepingly generalising statements that accuse modern women to be philanderers. While a minor grievance, the line jutted out like a sore thumb in a film that was otherwise thoughtful and pragmatic. The performances in Kalavu are yet another reminder of how we stereotype actors into boxes they can’t seem to get out of. Playing the vengeful Gautham, Karunakaran is quite a revelation and so is Venkat Prabhu who gets an extended cameo. Karunakaran begins on a shaky note but slowly turns more secure, giving a performance that makes us forget the several comic roles he is known for. Kalaiyarasan comes up with another good performance, which makes me wonder why we don’t see him more often on the big screen. Kalavu is the second film that has found a release via Zee 5, after waiting for an extended period to get a theatrical release. If not for anything, I am thankful for the onslaught of content that streaming sites have flooded Tamil cinema with. At least, we have an option for the "misfits" and rule-benders who can create what they aspire to and not what the market demands.